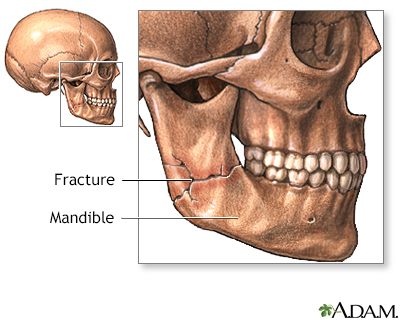 The most common cause of broken or dislocated jaw is accident or trauma involving a blow to the face. This may be the result of a motor vehicle accident, industrial accident, recreational/sports injury, or other accident. It may also result from assault. The goal of treatment is proper alignment of the jaw bone so the upper and lower teeth come together normally. Surgery is often required for moderate to severe fractures to align and immobilize the bone so it can heal.